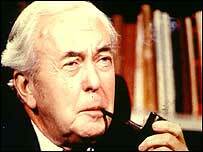 Newly-released Cabinet papers show Harold Wilson's exasperation with the government's PR skills in 1975. Wilson suggested asking for advice from ex-Daily Mirror editor Hugh Cudlipp on a publicity campaign on saving energy. He was unimpressed when other ministers were slow to act on his advice that PR campaigns needed "imagination". "My experience over 30-odd years is that they are never adequately done by a mixture of civil servants and PR forums," he wrote.